Click on the Image to Open the Photo Album. The Pancretan Association of America will proudly present the “Bridging of Cultures”, Andalucía - Crete concert, an intercultural cooperation of musicians and dancers from Andalucía (Spain) and Crete. Musicians from the Mediterranean region have initiated an effort to discover common cultural elements of music and dance which brought them to Andalucía, known for its flamenco music and dance traditions. The very instruments that express these two musical expressions accurately direct and determine the frame in which the inspiration and the imagination of each musician and performer bring to life in their performance and push it beyond its geographical limits. These two musical traditions inextricably linked with dance, as well as the improvisational mood of each individual musician, yield a new and refreshing outlook of the two regional cultures. 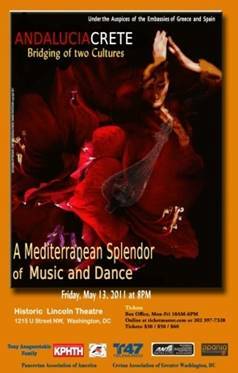 The performance is the result of a meeting of exceptional musicians and dancers from Andalucía and Crete, which was initiated by a group of Cretan musicians; John Papatzanis, Dimitris Koukoulitakis and Zacharias Spyridakis. In their search for common cultural musical elements around the Mediterranean region, they ended up in Andalucía in Spain, where they shared the sound and the dance of Crete with fellow Spaniard musicians and dancers. The passion in the music and dance they found paved the way for them to come together on stage and present the splendor and the commonalities of both cultures. It promises to be an outstanding event! More information and details will follow. Cretan music is one of the most important elements of our culture. It expresses our feelings in all stages of our lives as it also touches all stages of our history. 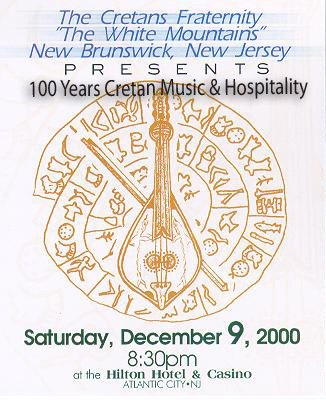 Recognizing the fact that each of the four regions in Crete has a very important influence to the Cretan music, our goal through “The Music of Crete” event, was to showcase that influence and appreciate its value. The ensemble featured the various musical instruments of Crete such as the violin, lyra, lyraki, laouto, boulgari and mandolin. Their performances and program were excellent, and they made the more than 2300 attendees for all 5 events, feel proud and honored for their heritage. PAA feels very proud for this initiative because such enriching tribute to our musical heritage has never happened before here in USA or in Crete! We also feel very proud for the hard work, “meraki” and belief for our initiative, shown once again by the hosting chapters! Thank You!! Thank You!! 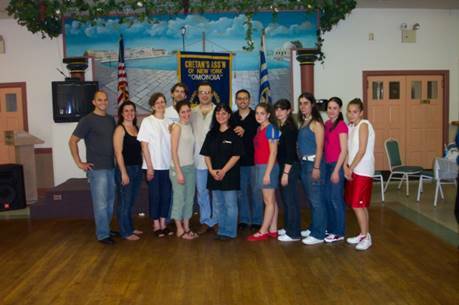 The performances at the respective cities have broken all records of number of attendees and that gives PAA more strength and will to continue our obligation towards our chapters and their members, as well as towards all Greeks in USA, to find ways to bring the splendor of our culture and values closer to their homes. Please continue to support and promote the values of our great culture! 3 City tour of the" Protomastores Concert Event"